We are still enduring one of the most frustrating experiences in recent years – trying to sell or even rent our house and all the ups and downs that go with that. We had our first offer yesterday but it was low so we countered and they decided to move on. We’ve already lowered the price $10,000 so no offer will be accepted unless it’s real close to the asking price. There’s also a problem with getting the for rent listing out on MLS, but this is being worked on. Right now only agents have been able to see it which means it is unseeable (not sure that’s a word!) to the general public that is looking for a house to rent. While I was writing just now a man stopped by with his sons and asked to see the house. He loved it and is bringing his significant other back in a couple of hours. He loved the man cave garage, the surround sound system in the living room and everything else. 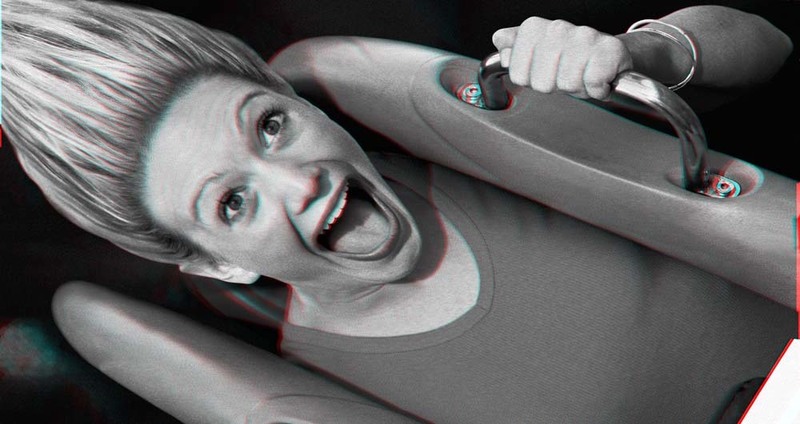 This is such a roller coaster ride with the highs of showings and the lows of not selling coming almost daily! Just heard that the couple that saw it yesterday really like it so maybe, just maybe – oh no here goes the roller coaster ride again! A friend from my youth, September, is having knee replacement surgery today. Please pray for her. 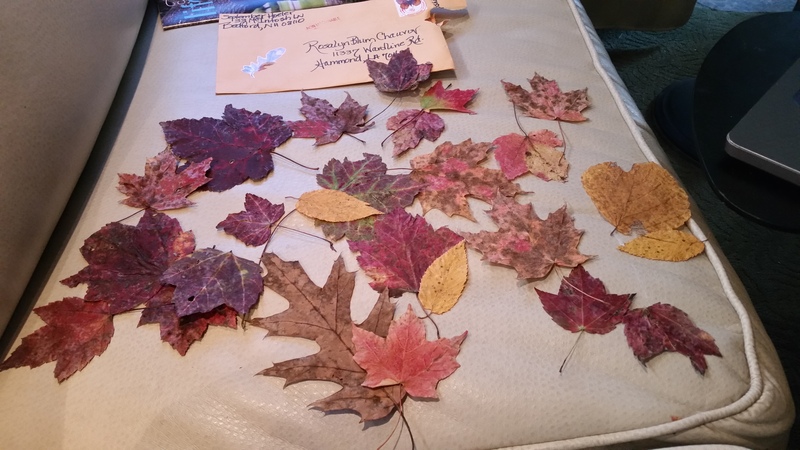 She sent me a package this week and when I opened it up I was surprised to see fall colored leaves! She lives in New Hampshire and I’ve commented about how beautiful the pictures she posts are of the trees with their glorious color. So she sent a little of New Hampshire to me! 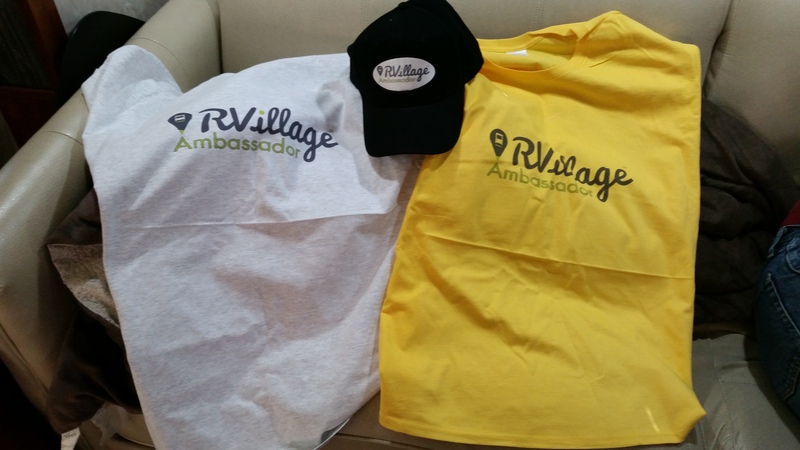 The company I work for and that Roy and I love sent us our RVillage Ambassadors t-shirts and cap. 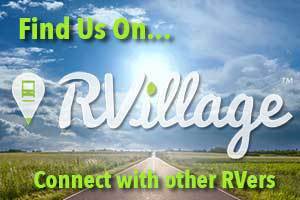 We now look more official when we visit RV parks to get them to claim their parks or when we’re telling other RVers about RVillage. An Ambassador is a non paid position where people who have some knowledge of RVillage try to spread the word through various means. We have meetings online to learn all the newest developments so we can explain them to others who have questions. It really helps the small paid staff not be spread so thin trying to do it all! Here’s our new goodies – the t-shirts do have arms, I just folded them under! Roy wanted to upgrade our interior lighting to 4″ LEDs for a while and I put him off as long as I could! They are not cheap and we need 30 of them. The picture below is after two of the three lights over one of the sofas were changed out to the new ones. The one on the right is the old light. What a difference these new technology bigger lights has made. Old folks have trouble seeing details without a lot of light and this helps both Roy and I see so much better. 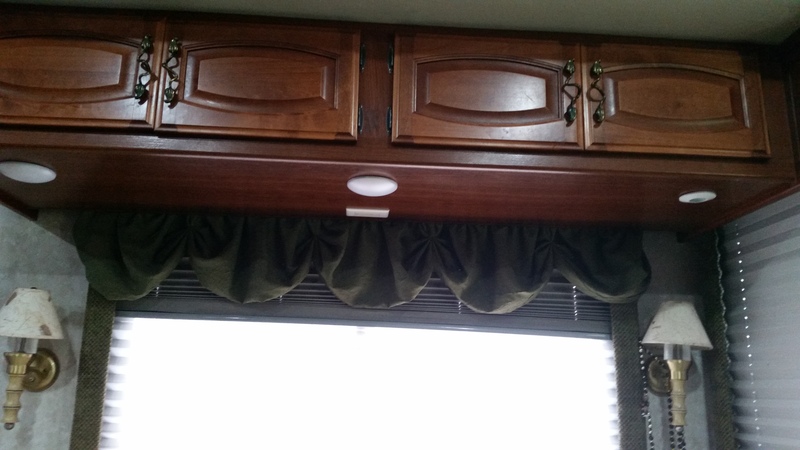 The ones down the center of the RV are dimable which is very helpful since when they are all on it’s like theater lighting! I see dirt I haven’t ever seen before so we’ll have an even cleaner RV with help from our new lights. A young woman who grew up in our church has just added published author to her long list of accomplishments. She’s now quite grown up and is a wife and mom of two teenagers and one little one, all girls! Her name is Rebecca Bankston Willoughby and her first novel is Raven’s Storm. I was in the middle of reading the 12 Comet Clement series when her book came out but I finally got to read it and I’m quite impressed. She writes more like a well seasoned author then a first timer! When I started reading I could not put it down. Rebecca Bankston Willoughby is an international award winning artist whose career began in the corporate world of commercial art. After years of traveling around the south, Rebecca settled into family life in her home town of Pumpkin Center, Louisiana with her husband Donny and their 3 daughters. With a deep love of her home state, Rebecca has chosen the fictional town of Davout, Louisiana as the setting of her first novel. She invites you to enjoy meeting the citizens of this quaint little southern town one book at a time. Here’s a summary of the book from the Amazon website. There are a lot of things to love about growing up in a small rural community in south Louisiana, but for lifelong resident Paige Barksdale, there is nothing she loves more than her family, her horse, … and Canan McCord. Unfortunately, only the horse and family return her love in equal portion. Even though she has finally reached the coveted status of adulthood, Canan still sees Paige as a child. Canan McCord is a man’s man, living his dreams. As VP of his father’s land management company, Canan spends his days in the woods surveying timber and heads right back out on the weekends to hunt and fish. Life is good. He even has a beautiful, accomplished girlfriend who is dropping strong hints about wanting to be promoted to “wife” — but something is holding him back from buying that ring. Something that looks an awful lot like the young, raven-haired beauty who grew up next door. To Paige, who fancies herself in love, the ten years between them is just a number. But to Canan, ten years seems much too wide a gap for love to cross. The harder he tries to stay away from Paige, however, the more she draws him in. When attraction flames to life in a duck blind, Canan is forced to see that Paige is much more than a little girl, but as quickly as the flame ignites, he rejects the idea that they could have a future together. As Paige comes to terms with the idea of a future without the man who holds her heart, a violent hurricane strikes the tiny town of Davout, Louisiana. As wind and rain sweep across the Bayou State, lives are lost and Paige and Canan are forced to discover who they really are–and what truly counts in life . . . and in love. I was so happy to hear that this is just the first in a series of book set in Davout, Louisiana. I love the small town aspect of the book and how she includes her beloved LSU into the story! 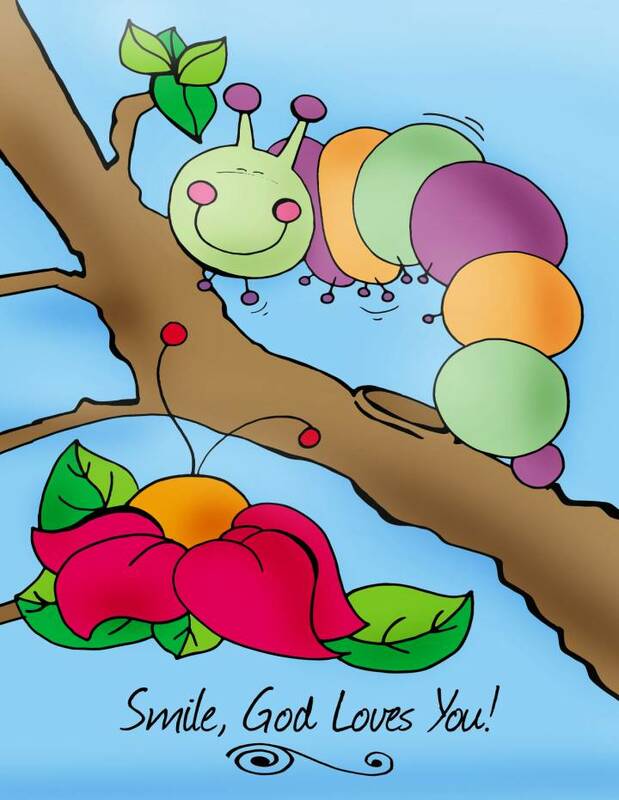 Great job Rebecca and anyone interested can buy it on Amazon for your kindle at only $3.99. I highly recommend Rebecca’s first book and look forward to many to come! Roy has three more weeks to work at Southeastern ending October 31st so he’s into a 15 day work day countdown. We know what a blessing this has been to have this income since we’ve been home. God’s timing is always perfect and we have to remember that always even at times like this when we’ve had to wait so long for the right buyer or renter to come along. Very hard to do but always the right thing. < 10.09.14 Sunny, cool, family day at Ms. Heather’s Pumpkin Patch! You TOTALLY rock! Thank You so much for the plug! Praying daily prayers over your house! I really wanted to let others know about your amazing writing. Glad you liked it! Can’t wait to read the next book!